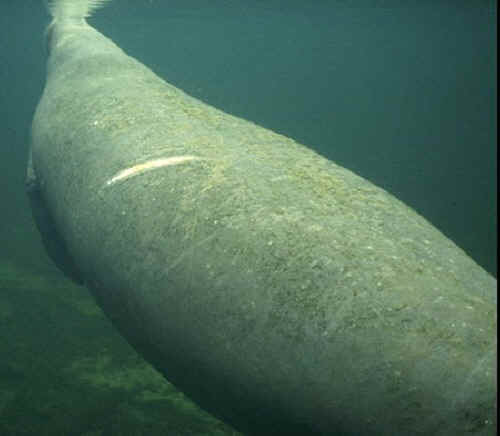 Deep Dent is a male manatee and first appeared at the warm waters of Blue Spring State Park in the winter of 1979. We don’t know where he wintered before that time, but we do know he must have liked what he saw, because Deep Dent has come back to Blue Spring many winters since that time. You might be wondering how in the world Deep Dent got his name. It’s because he has a deep “dent-like” scar on his head and tail and also extensive scarring on his back. Deep Dent got these scars when he met up with a motorboat and propeller, and he was definitely on the losing side of that encounter. Manatees usually only travel three to five miles per hour, and Deep Dent is proof that they are no match for fast-moving boats. Deep Dent is known to be a bit shy, and he is somewhat of a loner. This is not unusual for manatees. They are what is called “semi-social” animals and can be found traveling alone or occasionally with other manatees. Manatees sometimes gather in small, informal groups, but they have no leader or real herd structure. When manatees gather, it is mainly due to common habitat requirements such as warm water, fresh water, or food sources. Ranger Wayne Hartley, who tracks the manatees at Blue Spring, reports that Deep Dent will often hide when Ranger Wayne goes out early in the morning to identify and count the manatees in the spring run. He says Deep Dent will try to “hug” the bank of the run to avoid the research canoe. Despite his solitary status, Deep Dent does often arrive and depart Blue Spring in the company of other manatees. And when you think about it, that behavior is characteristic of manatees’ semi-social classification because it means they are gathering to seek the warm waters of Blue Spring in the winter or to strike out for better food sources in the spring. Deep Dent has often been seen traveling in and out for the season with fellow Save the Manatee Club adoptees Lenny, Troy, Floyd, and Lucille. Manatee researchers have documented that many manatees have preferred habitats they return to each year. Although Deep Dent appears to have adopted Blue Spring as his primary wintering area, he hasn’t fully committed to the park yet. His desire to travel and see other sites occasionally leads him to skip a winter season at Blue Spring or to depart early in the season for other destinations. Just last year, Ranger Wayne reported that Deep Dent was in for “a glorious eight days.” He had missed the previous five winter seasons at Blue Spring, and you can imagine that was certainly cause for worry. 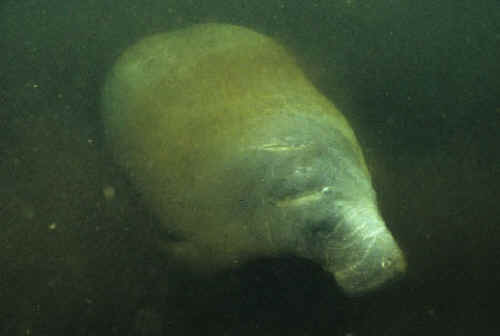 After checking with researchers at the U.S. Geological Survey, Sirenia Project (they track manatees along the east coast of the United States), Ranger Wayne discovered that when Deep Dent had gone missing in one previous year, he had been seen at the warm water outflow at the Florida Power and Light plant in Riviera Beach, Florida. Ranger Wayne suspects that Deep Dent may have been there the additional years as well. Deep Dent appears to have adopted Blue Spring as his home again, because he showed up in early December and has been a regular visitor to the spring run this winter. We can only hope that he will decide to come back again next year!